As in years before, there is never a lack of drama on the final day of the California State Fair Championship. And that drama played out until the last hole of the 90th playing of the event at the Alister Mackenzie-designed Haggin Oaks Golf Course. Corey Pereira, of Cameron Park, Calif., took the title after shooting a solid five-under-par 67 today posting a 16 under-par tournament total of 200. Pereira started the day one stroke back of the two-day leader, Jonathan De Los Reyes, who sat at 132 after a pair of 66’s. Pereira, a sophomore at University of Washington, had a strong start with birdies at 1, 4, and 5. De Los Reyes, a junior at Saint Mary’s College, had his own birdies at 1 and 6 leaving the two tied at 14-under-par after the first six holes. The two continued matching pars until the 14th hole. Pereira now held a narrow one stroke lead which he carried to 17 after the two made pars at 15 and 16. De Los Reyes fought back at the tricky par-five 17th. Both players reached the green in two and had eagle putts about 30 feet out almost on the same line. “That was my best shot of the day at 17. It was a hybrid and was a confident swing.” Pereira said. Pereira was away and stroked it to a few inches of the hole making the tap-in birdie, extending his lead to two. Taking advantage of the read he got from Pereira’s line, De Los Reyes drops the hooking putt for eagle leaving the two tied again at 15-under-par. After hooking his tee shot in the trees on 18, De Los Reyes second shot found a bunker that guards the green about 40 yards out. Pereira hit a great 3-wood onto the green landing three feet away from the pin, but bounded off the back of the firm green. Knowing he needed to make birdie for a chance at the win, De Los Reyes took a few extra looks at his lie in the bunker. His shot came out a little thin and ended up off the green in the rough to the left. He pitched it to eight feet. Pereira’s shot from behind the green caught some grass behind the ball and came out heavy, dribbling onto the green and ending up some 25 feet away from the hole, causing the gallery to gasp. But the 19-year old confidently rolled in the straight putt for birdie to take the title. De Los Reyes missed the eight-footer making bogey, giving Pereira a two stroke margin of victory. Pereira will head back to Washington brimming with confidence as he starts his tournament season in his own Husky Invitational in a few weeks. 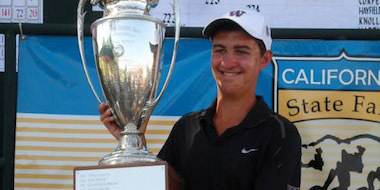 Although it’s not the biggest win for the Husky, as he won the Pacific Coast Amateur by eight strokes earlier in the year, it’s a special one because of the tournament history and the ties to Sacramento. Past champions in the 90-year history of the event include Al Geiberger, Ken Venturi, Kevin Sutherland and seven-time champion Verne Callison. De Los Reyes finished in second place with a 14-under-par 202 while K.K. Limbhasut finished in third at 12-under, 204. With a final round 65, Amol Mahal of San Mateo, Calif. catapulted up the leaderboard from 17th to finish tied for fourth with Granite Bay’s Brandon Baumgarten at 205. Limbhasut, who won the Western Junior back in June by eight shots, finished alone in third place, four shots behind the winner Pereira. Limbhasut, who hails from Loma Linda, Calif., will attend the University of California this fall for his freshman year.